WASHINGTON, D.C., JULY 11, 2012 (Zenit.org).- One of the traditional names given to the Blessed Virgin Mary is “Our Lady of Sorrows,” a title under which the faithful reflect on the sorrowful events of her life, specifically the traditional Seven Sorrows. Each of these focuses on a painful event of separation from her Son Jesus, whether prefigured in the prophecy of Simeon, threatened during the Flight to Egypt, experienced briefly prior to the Finding in the Temple, or finally embraced fully in the events surrounding the Crucifixion and burial of Jesus. The grief of Mary has been expressed beautifully in art through the centuries, such as Michaelangelo’s famous Pieta, and for many women who have experienced the loss of a child, the sorrows of Our Lady carry a particularly personal significance. Because of the uniquely strong bond between a mother and a child, added to the sense of untimeliness when a person dies before his or her parents, the effects of maternal bereavement have been a frequent topic of study and concern for psychologists. A recent study from the University of Notre Dame analyzed a large population of mothers in the United States aged 20 to 50 and found that in the first two years following the death of a child, the mother’s own risk of early death was elevated 133% over those mothers who had not lost a child (1). The authors found that the effects of bereavement were great regardless of the age of the child or the cause of death. While this study did not examine the impact of bereavement on fathers, the authors cited a previous study from Denmark in which the risks were shown to be elevated for mothers compared to fathers (2). Although both the Danish and American studies took into account socioeconomic factors, education level, and marital status of the bereaved mothers, neither considered the impact of religious faith on their ability to cope with the tragic loss of a child. However, many other reports have cited the positive effects of faith when dealing with stressful situations, including a review article which specifically highlights the importance of religion and spirituality when coping with the death of a child (3). The authors of the review emphasize that the death of a child is an “uncontrollable life event” and outlined some of the specific ways in which religious practices help a bereaved parent cope, such as the surrendering of control of the situation to God, the choice to seek intimacy with others in a religious context and closeness to God, and the search for supernatural meaning in the midst of loss. “In this great endeavor to create a new culture of life we are inspired and sustained by the confidence that comes from knowing that the Gospel of life, like the Kingdom of God itself, is growing and producing abundant fruit (cf. Mk 4:26-29). There is certainly an enormous disparity between the powerful resources available to the forces promoting the “culture of death” and the means at the disposal of those working for a “culture of life and love”. But we know that we can rely on the help of God, for whom nothing is impossible (cf. Mt 19:26). At a Mass on May 3, commemorating the 10th anniversary of the passing of His Eminence John Cardinal O’Connor, Archbishop Timothy M. Dolan of New York initiated a National Prayer Campaign for Life, which is being co-sponsored by the Sisters of Life and the Knights of Columbus. strengthen us with your Holy Spirit to receive the abundance of life you have promised. 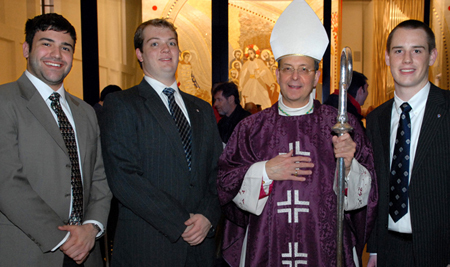 Knights from Sacred Heart University in Fairfield, Conn., greet Supreme Chaplain Bishop William E. Lori following a Mass Bishop Lori celebrated at the Sacred Heart in 2009. The lay apostolate must respond to the constant call for active involvement in the work of the Church. Your council-5476 has the numbers, the organization, and the communication ability to get involved and spread the word throughout the Christian community. Contact St. Bridget Church Knights of Columbus Council-5476 for more information, or if you have any questions. Take a look at what’s happening to our family life. Do we communicate? Do we share? Do we take time to get involved with each other? Are there opportunities for improvement? What is God’s plan for us? Usually, these perceptions are formed by the concrete reality of the world immediately around us. It may be a bustling metropolis, a town, a tiny village, a large county, a broad rural area. It is the place we call home – with all its good and bad features, its beauty and ugliness, its strengths and weaknesses. Every individual has a voice in shaping the world around him, and every individual can make that voice heard. Do more than throw up your hands in despair over what’s wrong with the world. Your community offers limitless opportunity for action that can be seen, felt and judged for its true worth. 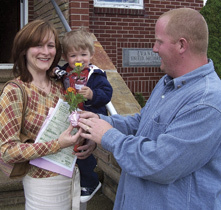 Look for something that’s needed and workable in your community – fight poverty, aid individuals with intellectual disabilities, plant a tree, sponsor a blood pressure screening, support law enforcement, campaign for every baby’s right to life, help the aged – whatever your community’s needs, your members’ interests and your council’s resources allow. Almighty God, Father of all nations, for freedom you have set us free in Christ Jesus. We praise and bless you for the gift of religious liberty, the foundation of human rights, justice, and the common good. Grant to our leaders the wisdom to protect and promote our liberties; By your grace may we have the courage to defend them, for ourselves and for all those who live in this blessed land. WELCOME to Knights of Columbus – Council 5476’s new web site, established July 18, 2012! This is our invitation to follow us online, contact us for more information, or join us in our good works. Council 5476 meets on the fourth Thursday of each month at 6:30 PM. Meetings take place in the basement of the Church Rectory, in the Knight’s meeting hall.